Now that the gifts have been given, I can post about a few of the handmade things I gifted this Christmas. My wonderful husband, who loves to cook, asked for an apron for Christmas. Since I am physically incapable of giving something as plain and boring as a white apron, I decided it would be the perfect gift for the kids to give to their daddy. 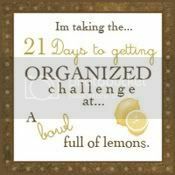 I started with a plain white apron from Target ($5.99). 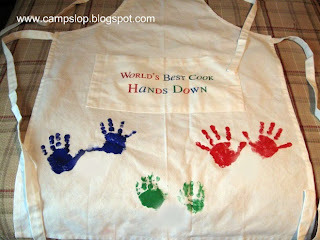 Using acrylic paint (I let the kids choose the colors) I painted their hands for prints at the bottom of the apron. Wild One's prints turned out a bit wonky. Apparently finger painting is NOT one of her favorite activities. Next I custom ordered an iron on transfer that read "World's Best Cook Hands Down" from etsy. Heather, from All You Need Designs, was AWESOME to work with and does great work!! I love that saying with the hand prints. Great idea.